Today I wanted to touch base on something that is really beginning to annoy me - how varied clothing sizes can be. Being someone who is fairly petite - I'm 5ft 1" in case any of you were wondering - I struggle to find clothes that fit me properly and nicely everywhere. My figure is all in proportion and nothing is either too big nor too small, so, in theory, clothes should fit me properly. However, this is not the case. 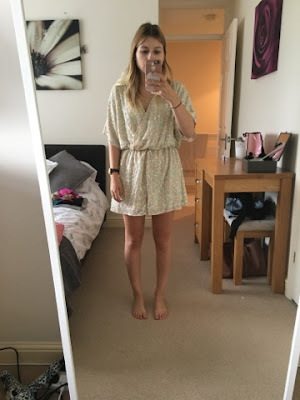 Just last week I ordered a size 4 playsuit from ASOS and it was waaay too big, I'm not even a regular size 4 - I would say I'm a typical size 6 - so this playsuit should have actually been too small for me. I was gutted, to say the least, because I was really looking forward to owning this playsuit as it is beautiful. See the photo's below of me wearing it, it doesn't look massively too big for me in the photo where I'm wearing the heeled wedges, but there was just soo much material and it was super baggy - as you can see in the first photo. I understand that this style is supposed to be baggy but I know the difference between something being baggy and something being just too big. Put it this way, my mum is a size 10/12 and she tried this playsuit on and it just about fit her (it was nearly too big for her as well!) - I would post a photo of my mum wearing it, but out of respect for her I'm not going to share that photo as I know she wouldn't like it. Admittedly, I didn't order the Petite version as they never make enough of these sizes so that option literally sold out in less than a week, but the fact that this playsuit fitted a size 10-12 when it's supposed to fit a size 4 is just ridiculous. I am extremely disappointed and fed up with this, it's something I encounter on a much too regular basis and it just wastes time for everyone having to constantly return items because it's a small size that's too big. We are constantly wasting plastic and fuel with all of this ordering and returning, just because clothing companies cannot get their sizings correct. It's causing unnecessary environmental damage (bit extreme? But possibly and probably true). Basically, what I'm trying to say is that there should be one fit for each size that every clothing company has to go by and meet the correct measurements set (give or take a few inches) and every company should also have a Petite range (and a Tall, Plus and Curve range for that matter) so that everyone is catered to as it's not fair for a load of us to be missing out. I know it's s u c h a #firstworldproblem but I think it's something that a lot of us girl's experience on a much too regular basis. It's about time that something in the clothing industry was changed in order to minimise this recurring issue. Hopefully you guys agree with me or understand the point I'm trying to make, this is quite a different post for me to create but I quite enjoyed having the words and sentences flow without thinking about it!